When a Fairy God Mother (FGM) grants one of your wishes from your list, Please post a Thank You in this thread. DO NOT IDENTIFY your FGM when posting here. Thank you to a very thoughtful Mississippi FGM whom I've never encountered here at Crochetville at least under her Ravelry ID. I am very much looking forward to making the 3 Blues Dress set. It actually is made with yarn I should be able to locate. Thank you so much for making what has been a crazy day so much fun. I have been having a off week and I received 2 different patterns from 2 different FGM"s. Thank you both so much. I can't wait to try the monster baskets and the hat pattern. Thank you! Thank you! Yesterday was a dark and dreary day, with lots of rain. 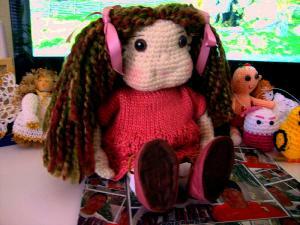 Then the mail came and I got this beautiful AMI doll from my FGM in CT. It really brought the sunshine out. She is just to adorable. I love her hair. Got pictures this morning, while the sun is peaking out. Not sure if it wants to stay out or not. Thank you FGM you really made my day. Oh she is now sitting in the back at ami town, but she will soon come out front. Wow. That's an awesome doll. Gotta love that hair! 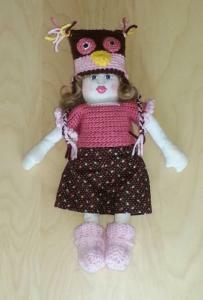 to a very thoughtful FL FGM for the Sweet and Sassy 18" Doll pattern. I've downloaded it and will be learning the Chainless Single Crochet to get started on it. It looks like lots of fun. Thank you to my FGM from Mississippi, whom I've also never encountered here on the forums - for the crochet hook tote bag pattern!! Can't wait to make this!! A few days ago I was surprised by the huge envelope waiting for me at the PO, filled with loads of wonderful things! I was happy as a child watching all these crocheter's treasures! 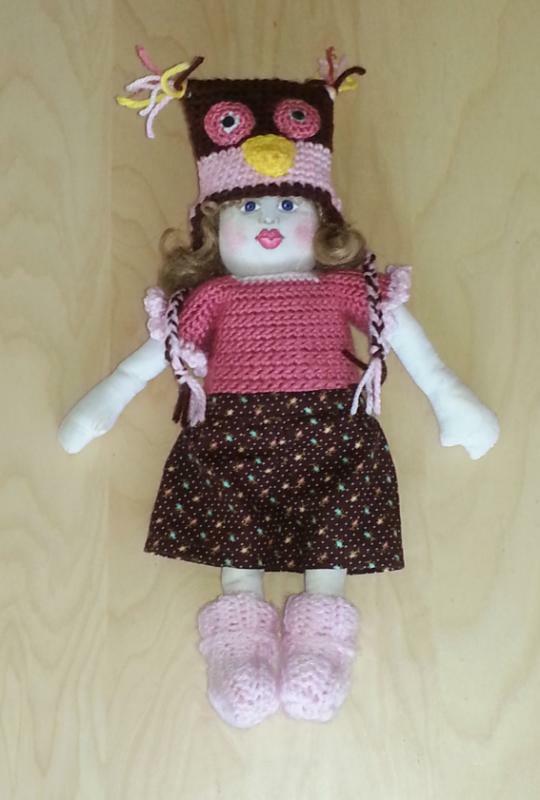 Look at this wonderful handmade doll! (There's a little war between me and my DD on whose doll it is ). 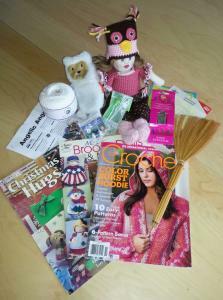 I got patterns for another type of broom dolls - and the broom for it, ornaments and crochet magazine. 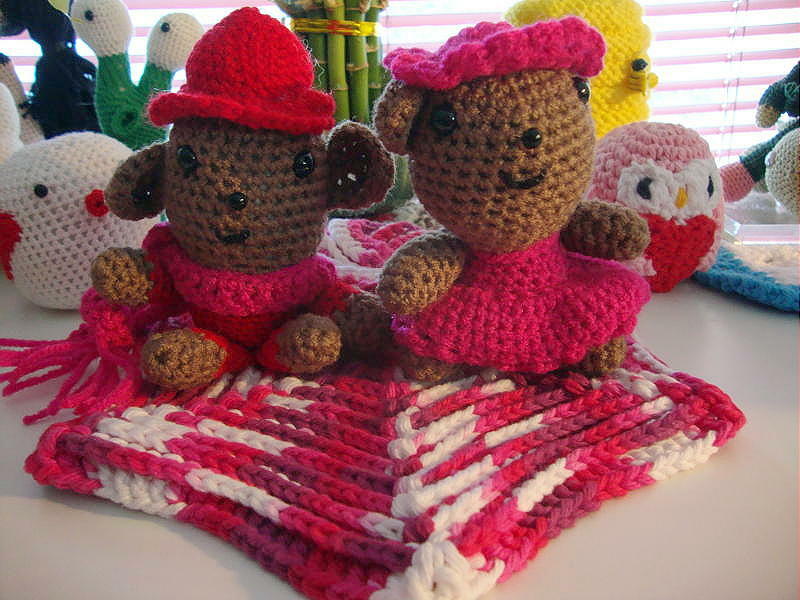 I got the kit for Angelic Angel and the pattern for Twinkle Stripes Kerchief together with FGM's helpful notes on it. In the zipper sheep were some pins and a row counter and the needles hidden. I also found a set of hooks with folded scissors and a lovely letter in the package. I want to thank my MA. FGM for the adorable bears. She also named them Valentino and Valentina. I found this funny, as my Dad's first name was Valentine. How perfect is that? She also sent a scrubbie and a dishcloth. Everything is now sitting on my table. I got them yesterday, but it rained most of the day and we could not get good pictures. The sun is out today, so look at how pretty they are. I received a surprise package from my Fairy Godmother in Florida when I took in my mail Wednesday afternoon. I had to have a tooth extraction yesterday so I wasn't up to posting that evening,. Thank you so much FGM...It was really unexpected. I love the 2 crochet hooks with the wooden handles. They are so confortible in my hands. I have arthritic fingers so they will be perfect for the projects I will make that require these big M & N hooks. I can't thank you enough. It was so thoughtful of you. What a nice surprise to wake up to this morning! I received the Owl Tote pattern from a very kind Mississippi FGM! Thank you so very much, can't wait to start it.